Amazing news everyone, SceneBuilder 2.0 is released today. It has many cool new features and was a complete rewrite from the ground up so that it can be split into parts and embedded in your favorite IDE. JavaFX Scene Builder Kit. JavaFX Scene Builder Kit is an API that allows the integration of Scene Builder panels and functionalities directly into the GUI of a larger application, or a Java IDE, such as NetBeans, IntelliJ, and Eclipse. See Working with the JavaFX Scene Builder Kit for more details. Ability to add custom GUI components to the Library. Custom components imported from a third party JAR file can now be added permanently to the Library of available GUI components. See Adding Custom Components to the Library for more information. Support for new JavaFX 8 UI components. The new UI components, TreeTableView, DatePicker, and SwingNode, that were introduced in the Java SE 8 are now supported in Scene Builder 2.0. To see the list of JavaFX 8 UI components that are available, type FX8 in the Library panel’s search text field. 3D Support. FXML documents containing 3D objects can now be loaded and saved in the Scene Builder tool. You can view and edit properties of the 3D objects using the Inspector panel. 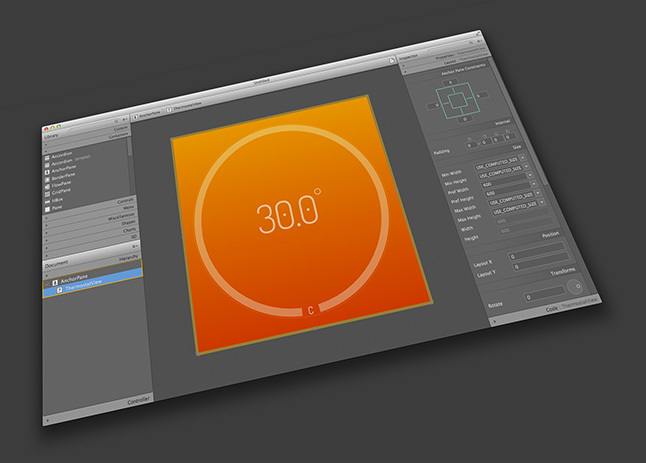 You can not, however, create new 3D objects using the Scene Builder tool. See JavaFX Scene Builder User Guide for more information. Support for Rich Text. A new container, TextFlow, is now available in the Library of GUI components. You can drag multiple text nodes and other types of nodes, into the a TextFlow container. You can also directly manipulate the text nodes to re-arrange them in the container. Inline and property editing features are also available for each text node. Library Panel Improvements. The default viewing option for the Library panel is a new feature that gives you the option to view all the component categories as collapsible sections. Hierarchy Panel Improvements. It is now more flexible to re-parent objects from one container to another container. It is also possible to drag and drop an object from the Hierarchy Panel to the Content Panel, and vice versa. You can also now select multiple objects in the Hierarchy Panel in order to re-parent them. Content Panel Improvements. You can now manipulate the components of an HBox, VBox, FlowPane, or Toolbar container directly in the Content Panel to re-order them. You can also insert a new component at any position in the container. Note that this direct manipulation is currently not available for the TilePane container. Inspector Panel Improvements. Many property editors in the Inspector panel use the Suggested List dialog window, which displays a list of selectable values from which you can make a selection instead of manually entering them. For example, the CSS Style editor provides a list of applicable CSS properties, based on the currently selected object(s). List handling has also been simplified. Multi-selection of components of different types (i.e. Button + TextField) is now supported. In addition, the usability of many of the property editors, such as AnchorPane Constraints, Rotate, and Padding, have been improved. Preview Window Improvements. The content in the Preview window is now automatically refreshed as the current FXML document is being edited. Hence, there’s no need to use the Refresh command in order to preview the modified UI layout. Change in the Include FXML Command. When you click File from the Menu bar and then click Include, you can only select the FXML menu item if the current FXML document you are editing is saved on your system’s disk and is not empty. How about maven integration so it adds the project classpath when editing an FXML file? Currently, working with custom components can be very tedious. If NB/SB could automatically pick up the project classpath, editing FXML with custom components would be easier. The idea of adding custom components to scene builder can be time consuming in an environment with multiple custom components in different jars. Impressive! Also thanks a lot for the source code. this blog is the best part of javafx technology. this is so great, for the first i developed a desktop software using Java(javafx) that used in my friends restaurant.What i want to say is the SceneBuilder makes Java GUI development easy!!!! Scene builder is ok for small projects, but I have found that it is a major memory hog and can be very slow with medium complicated pages, like when using a multi-tab pane. I feel like I am working with an Adobe product as memory leaks seem to be just as common and the over-head way too much for the operations it performs. After several position tweaks(painfully slow response) of a label, for instance, the needed RAM ramps up to Gigabytes, and it doesn’t let it go until I shut the program off. I have a reasonably high end PC, 16GB Ram, i7 proc., and after several years of building Scene Builder simply should not be this poor.